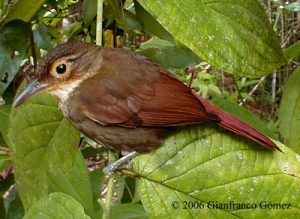 The Buff-throated Foliage Gleaner (Automolus ochrolaemus) is part of the ovenbird family, an extremely diverse group of birds in form and habits. Besides, foliage gleaners, there are treerunners, leaftossers, castlebuilders and treehunters. The ovenbird name comes from nests of many species that resemble “baking ovens” placed on the ground. Most species in the ovenbird family build some sort of covered nest or place it in a covered structure. The Buff-throated Foliage Gleaner builds its nest at the end of a burrow as long as 30” deep along the side of an embankment beside a trail or stream and nest from February to May. They forage for insects, spiders, small frogs and lizards from within curled up dead leaves or leaf litter in tree thickets in mature or secondary wet forest. They spend a lot of their time hanging upside down or creeping along branches and often travel alone or in pairs sometimes in mixed species flocks. They are commonly found in lowland forests of both the Caribbean and Pacific slopes and are common here on the Osa Peninsula at the Osa Biodiversity Center. They range from South Mexico all the way down to the Amazon in Brazil. Most notably they puff out their throats when they get excited! We would like to thank Gianfranco Gomez from the Drake Bay Rainforest Chalet for their stunning photographs and allowing us to showcase them. You can find them just up the coast from us in Drake Bay, Costa Rica.